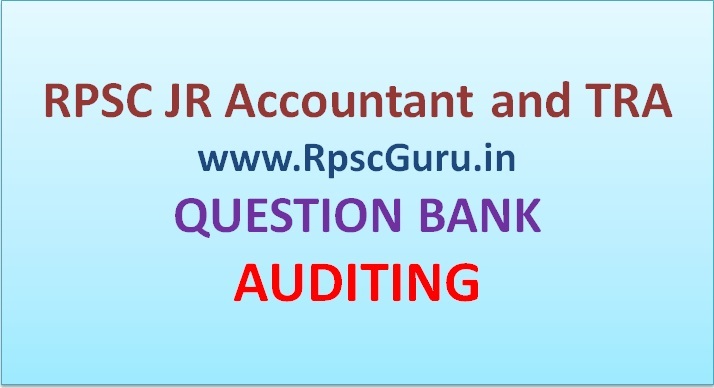 Dear RpscGuru expert readers in this post we are sharing 27 most important MCQ practic questions for RPSC Jr Accountant Second Paper. Auditing part is most important part for gating score in second paper. There are ask 25 questions and each questions are 3 marks. So after that you will easily gate 65-70 marks in this audit session. Read care fully these Audit Notes and get more score in second paper. We are provided only expected questions which are most possible to ask in exams. d) Depends on the type of audit. 3. Which of the following is not true about opinion on financial statements? a) The auditor should express an opinion on financial statements. c) The auditor’s responsibility for detection and prevention of errors and frauds is similar. a) He should inform the management. c) The auditor should ensure financial statements are adjusted for detected errors. 8. Which of the following is not a limitation of audit as per AAS­4? d) d) Limitations of internal control system. 9. How many principles are listed in AAS­1 which govern auditor’s professional obligation? b) Auditing lends credibility dimension and quality dimension to the financial statements prepared by the accountant. 13. Which of the following factors likely to be identified as a fraud factor by the auditor? a) The company is planning a initial public offer of quality shares to raise additional capital for expansion. b) Bank reconciliation statement includes deposits­in­transit. c) Plant and machinery is sold at a loss. d) The company has made political contributions. 15. Which of the following statements is correct concerning the required documentation in working papers of fraud risk assessment undertaken by the auditor? a) All risk factors as mentioned in AAS­4, should be considered and documented along with response to them. b) Document the identification of fraud risk factors along with response to them. c) Document material fraud, risk factors and response to them. d) No documentation in required. 16. Which of the following is the most appropriate potential reaction of the auditor to his assessment that the risk of material misstatement due to fraud is high in relation to existence of inventory? 19. Which of the following information should a successor auditor obtain during the inquiry of the predecessor auditor before accepting engagement? 21. The use of an audit engagement letter is the best method of assuring the auditor will have which of the following? 26. Which of the following is not a quality control consideration on accepting a new client? a) Make constructive suggestions concerning improvements to the client’s internal control system. c) Understand the events and transactions that may have an effect on client’s financial statements. 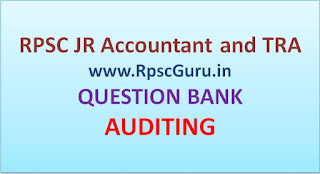 We are advised to our RG Expert reders for stay connected with us we are updating more study materials for RPSC JR Accountant and TRA Exam 2013 and more other exams all that free of costs. Comments your excepted requirements as under we will provided as soon as possible.